1 1/2 jar (454 g) Grape leaves pickled in brine, rinse each leaf before use. enough boiling water to cover the stuffed grape leaves. 3 cups short grain white rice(known here as Egyptian rice), washed and drained. 1/2 teaspoon Arabic Gulf mix spice*. 3/4 cup scallion(green onion),finely chopped. 1)Mix well all filling ingredients. 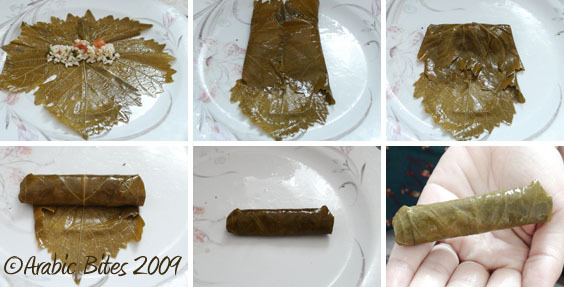 leaf,roll up firmly,folding in sides to enclose filling. 3)Cover base of 30 cm heavy-based pan with tomatoes & potatoes slices,place stuffed grape leaves in layers over tomatoes & potatoes,pour over combined lemon juice,oil,salt & boiling water. 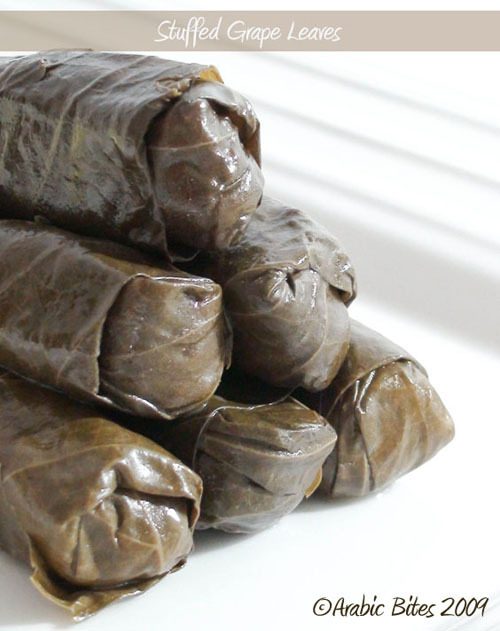 4)Place a plate on top of stuffed leaves to keep stuffed leaves in position during cooking. 5)Simmer,covered,over low heat about 1 1/2 to 2 hours or until cooked through. Mahshy warqenab also known as Dulma,yabre. Every Arab country make it with different filling & spices. *for spice you can use allspice. also you can use minced meat in the filling. 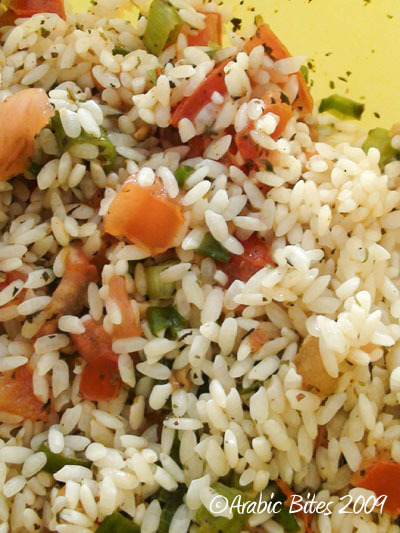 This recipe can be made a day ahead & serve cold to enjoy the better flavor. That is a wonderful speciality I adore! This is an amazing recipe. I love how you pile the grape leaves on top of potatoes and tomatoes, great pictures too. jazakallaahu Khair, cannot wait to make this! Oh wow...that's very new to me...looks yum...As per the event Joy From Fasting To Feasting (Season-II) send me the links of the recipes which are prepared specially in Ramadan....u can also send from the archives.....I am thinking of a database for Ramadan Recipes from the globe. These sound so good! I love making stuffed grape leaves, but I have never cooked them potatoes and tomatoes and I think that sounds amazing! Will certainly try next time! Looks great, and healthy, too! 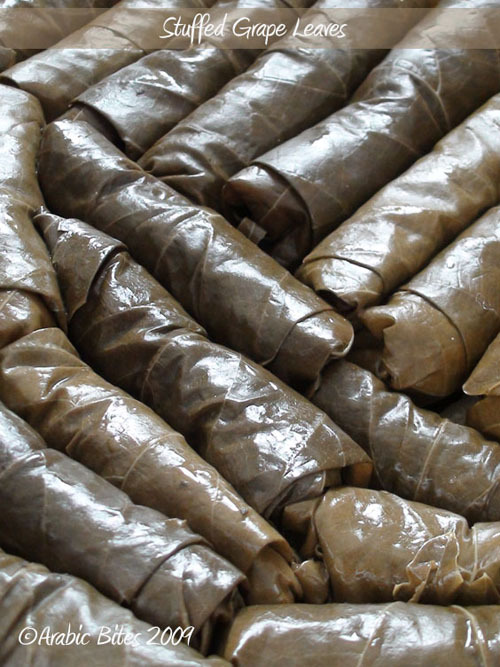 Just recently we had Dolmas. Loved it. I love the filling you have done & thanks for that illustration in wrapping .. so neatly done. if i wanted to make it with minced meat and do i cook it differently? also i heard some people put meat with the potatoes in the bottom for flavor can u explain about this? The cooking method still the same,& also you can add the meat in the bottom with the potatoes,just make sure to add enough boiling water to let all the ingredients cook well. Assalaam Alaikum! Wow, masha'allah, these look amazing...just like the rest of your food! I made the mistake of finding your blog when I was fasting and needless to say, that was a hard day of fasting ;) I've been hooked to your blog ever since and keep coming back for inspiration and recipes. May Allah accept your fasting, efforts and deeds, ameen! I adore stuffed grape leaves, but have never made them. Thanks for the recipe! This looks delicious! I've never used grape leaves, but have been wanting to for quite some time! Wonderful recipe! Is is possible to make these in a frying pan since all my pots are tiny! Or, a crockpot?